Traveling can take you all over the world where you can learn about another culture, see new sights, and experience life in a different way. However, not all travel has to take you to far away lands; my latest trip took me just an hour or so away from home to the South Coast Winery Resort and Spa in Temecula. While I didn’t travel far, I was transported to another world filled with vineyards, food and wine that all made for a memorable weekend. We always enjoy a little extra space when we travel and the villas at South Coast Winery Resort and Spa were perfect for the two of us on our weekend getaway. We had a small dinette and living area that allowed us to start our mornings as we prefer – with a warm cup of coffee in our room. My husband will happily go out and get coffee if we need to, but it is always a true vacation to him when we can make good coffee in our room. The room and bathroom were both spacious, but our favorite feature was definitely the private outdoor patio. As I mentioned, we loved the outdoor patio but fell head over heels in love with our room location the first morning of our trip when we woke to a beautiful sunrise right over the vineyard. The dew glistened on the grapes as the sun shone down on them. We could soak up the simple beauty of the moment in our robes with a cup of coffee. It was pure bliss. TravelingMom Tip: Not all villas have this view so be sure to ask for the location when booking a room. This was our first trip to Temecula, which is truly crazy considering how much my husband and I love wine. We had a few hours before check-in so took a short five-minute walk to Ponte Winery. It’s located next to South Coast Winery Resort and Spa. From the moment we entered Ponte Winery, we felt like we had come home. The staff treated us like family and the light airy space made us feel like we were sipping wine near the beach. Then we started the wine tasting and we knew we had found a favorite winery for the two of us. Ponte Winery’s belief is that “if you like it, it’s good wine.” That made for a relaxing and no pressure added wine tasting experience. Because while we love wine, we are not wine experts by any means. We have our favorite varietals and wineries and tend to stick to those for the most part. So the core belief of Ponte resonated with us as a couple. Honestly, my husband and I take very few trips alone because our kids are such great travelers and love seeing the world. Given we had some true alone time, we indulged in a massage at GrapeSeed Spa, which is right on property at South Coast Winery. The South Coast Classic was just what we needed to ease away any stress and helped us decompress. Starting our getaway with some pampering helped us both get in the full relaxation mode of travel that much faster. We found a few new wines at Ponte Winery that we couldn’t wait to try. Thanks to the lovely villa accommodations, we could chill our wine a bit and enjoy a few glasses in the comfort of our room. As we enjoyed a glass walking through the vineyard at night, I couldn’t really imagine a more perfect evening. The Mercantile is one of the original buildings of Temecula. It has been restored and is home to a Jazz show each Thursday evening. The Merc is a small and intimate space producing some lovely acoustics. We found it to be a unique environment that transported us back in time and were so happy we went because we got to experience Old Town Temecula. The shows change weekly at The Merc and tickets are $15 per person. A hot air balloon ride has been on our bucket list for quite some time. Given that Temecula is known for their hot air balloon rides, there was no time like the present. The moment the balloon took off and it was just pure silence as we floated over Temecula is one I will not soon forget. The air provided the same sense of peace for me that the ocean does when we are on our boat. The hot air balloon ride we took with A Grape Escape was a definite high for both my husband and me. Staying at South Coast Winery Resort and Spa made getting around the area safely incredibly easy. We walked to some wineries and when we drove, it was literally a matter of a few minutes. 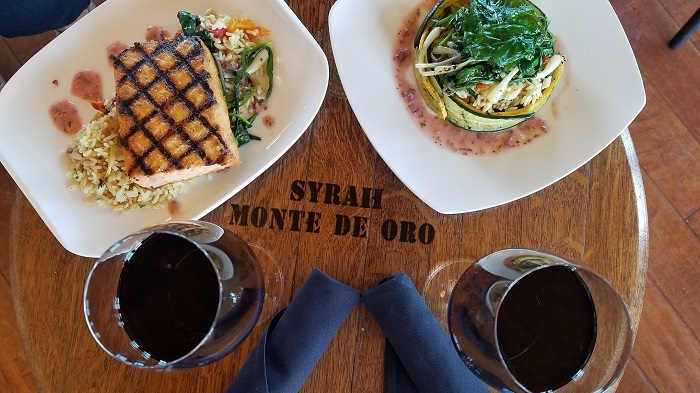 We love learning how wine is made and had the chance to take a VIP tour at Monte de Oro Winery, which is located right near South Coast Winery. Of the wineries we visited, Monte de Oro earns a top pick for us alongside Ponte Winery. Come to find out that Monte de Oro is a vegan winery and as part of their fining and filtering process, they use racking as opposed to what some wineries do – fine and filter with egg whites. Enter one TMOM with an egg allergy and now we know why I experience the reaction I do. We sampled wines directly from their barrels and ended with a much-welcomed lunch in their members only Barrel Lounge. It’s sad but true that all good things must come to an end. But sipping mimosas and enjoying breakfast on property at Vineyard Rose before we left made the departure just a bit easier.